This section has been plagiarized for your convenience, from Allen Eyles' books, The Marx Brothers -- Their World Of Comedy (Cranbury, New Jersey, A.S. Barnes and Co., Inc., 1968) and The Complete Films of The Marx Bros. (New York, Citadel Press, 1992). It provides a chronological listing of the work of the Marx Brothers, individually and in various groupings, after they finally hit the "big time." 1924 -- May 19: Stage show I'll Say She Is, scripted by Will B. Johnstone, opened at the Casino and became a roaring success. 1925 -- Film Too Many Kisses appeared with Harpo in a supporting role. This romantic comedy in a Spanish setting had Richard Dix, Frances Howard, Joe Burke, William Powell, Frank Currier, and Paul Panzer billed before Harpo. Details are lacking of how he came to be in this which even seems to pre-date their first real Broadway play. December 8: Stage play The Cocoanuts opened at the Lyric and ran for 275 performances, a full season on Broadway, as well as two years on the road. 1928 -- October 23: Stage play Animal Crackers opened at the 44th Street Theater and ran for 191 performances. It was laid off the following summer, went on tour in mid-October. 1929 -- Book by Groucho, Beds, was being serialized in the magazine College Humor prior to publication in 1930. 1931 -- The House That Shadows Built was a promotional short made by The Four Marx Brothers for Paramount, and featured a revamped version of the opening scene of I'll Say She Is. 1932 -- Groucho, Harpo, and Chico were featured in part of Paramount's series called Hollywood On Parade. 1933 -- Chico was featured in another part of Paramount's Hollywood On Parade. 1934 -- Half-hour radio show, Flywheel, Shyster and Flywheel written by Arthur Sheekman and Nat Perrin, sponsored by Esso, starred Groucho and Chico, and ran for 26 weeks. Harpo made a triumphant tour of Russia. Groucho also played straight in a revival of Twentieth Century. 1935 -- MGM short in early Technicolor, La Fiesta de Santa Barbara, featured Buster Keaton, Leo Carillo, Robert Taylor and Harpo Marx. Harpo's red wig presumably made a fine challenge for the color process. 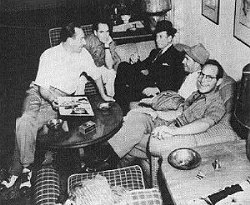 1936 -- Groucho was an extra in the film Yours for the Asking, featuring George Raft. Chico played himself in "An MGM Miniature" called Hollywood -- The Next Step with Maureen O'Sullivan. 1937 -- Film The King and the Chorus Girl was released. Its story -- a topical one about a king who married a commoner -- was by Groucho and Norman Krasna. Mervyn LeRoy directed Fernand Gravet, Joan Blondell and Edward Everett Horton in this successful film. In the advertising a small picture of Groucho appeared with the words "He wrote it!" Groucho and wife Ruth appeared in an MGM short called Sunday Night at the Trocadero. A Groucho-Chico radio sketch by the late Al Boasberg was found to have infringed a copyright and the two Marxes asked the court's advice on the best prisons. 1939 -- Radio's The Kellogg Show starred Groucho and Chico but stopped at the outbreak of war in Europe. 1941 and 1942 -- Groucho was a regular guest on The Rudy Vallee Show. 1942 -- Book by Groucho, Many Happy Returns, was published. 1943 -- Chico headed his own band, did piano solos and lines in Italian dialect. Groucho was featured in Columbia's Screen Snapshots No. 2 and Groucho, Harpo, and Chico were featured in Screen Snapshots No. 8. Harpo appeared briefly in the film Stagedoor Canteen. 1944 -- Chico appeared alone in the big revue Take A Bow. Harpo played in a revival of The Man Who Came to Dinner and appeared very briefly in the film Hollywood Canteen. Groucho started a radio series, The Pabst Show, but was replaced by up and coming Danny Kaye. 1945 -- Harpo appeared in the 20th Century Fox film, The All-Star Bond Rally. 1947 -- Film Copacabana, directed by Alfred E. Green with Carmen Miranda and Steve Cochran, starred Groucho as Lionel Q. Devereaux, delivering passable wisecracks as a penniless agent in much the Room Service situation and reverting briefly to traditional moustache and costume for a spirited rendering of Kalmar and Ruby's number Go West Young Man -- a glimpse of the old magic. 1948 -- September 27: Play Time for Elizabeth by Norman Krasna and Groucho Marx opened at the Fulton Theater on Broadway and closed after 8 performances. The authors had started writing it in 1941 under the title Middle Ages. 1950 -- Film Mr. Music featured Groucho as a guest star. A dull, overlong comedy directed by fellow humorist Richard Haydn. Groucho shows up for a student show and performs a comedy song, Life Is So Peculiar, interrupted by a vaudeville routine (Bing Crosby acting as feed). Chico was featured in the Papa Romani episode of television's Silver Theatre and was a regular on College Bowl. 1951 -- In an intriguing piece of casting Harpo was to play Androcles in Chester Erskine's film of Shaw's Androcles and the Lion but the studio head Howard Hughes insisted on substituting his discovery Alan Young for the role. Groucho started his long-running show You Bet Your Life. There were both radio and TV versions which won awards and high ratings. Film Double Dynamite, directed by Irving Cummings with Jane Russell and Frank Sinatra, co-starred Groucho as a waiter, Emil J. Kech. 1952 -- Film A Girl in Every Port, directed by Chester Erskine with Marie Wilson and William Bendix, co-starred Groucho. S.J. Perelman Has described a visit to the set in I'll Always Call You Schnorrer, My African Explorer. 1953 -- TV series College Bowl featured Chico as the proprietor of an ice-cream parlor and college hang-out. He generally played the piano in each show. 1955 -- Harpo appeared as himself in an episode of I Love Lucy. 1957 -- Film Will Success Spoil Rock Hunter? (in Britain: Oh! For a Man!) produced Groucho as the secret love of the Jane Mansfield character. Film The Story of Mankind, directed by Irwin Allen from his screenplay with Charles Bennett, featured the Marx Brothers. Harpo appeared in the Snow Shoes episode of Playhouse 90. 1958 -- TV production (Playhouse 90), No Time At All, had Chico as a guest star portraying Mr. Kramer. Groucho and Chico appeared with Ernie Kovacs, Bob Hope, Bing Crosby, and others in Showdown at Ulcer Gulch. Harpo appeared in the DuPont Show of the Month, The Red Mill. 1959 -- March 8: Telecast of The Incredible Jewel Robbery, a Revue production directed by Mitchell Leisen, produced by Harry Tugend, written by Dallas Gaultois and James Edmiston, with music by Elmer Bernstein. Book Groucho and Me was published -- written by Groucho. 1950s (date unknown) -- Chico was a guest star in Sports Antics. 1960 -- April: one-hour color telecast of The Mikado by Gilbert and Sullivan starred Groucho as Koko. Harpo appeared in the Silent Panic episode of The June Allyson Show. 1961 -- Harpo wrote book Harpo Speaks! with Rowland Barber and appeared in Got It Made for Ford Motors. Groucho narrated the DuPont Show of the Week, Merrily We Roll Along, and Harpo starred in the DuPont Show of the Week, The Wonderful World of Toys. 1962 -- Groucho was the announcer on the weekly TV quiz show, Tell It To Groucho. He also starred in The Holdout, an episode of G.E. Theater. Harpo appeared in The Musicale, an episode of Mr. Smith Goes to Washington. 1964 -- Groucho Starred in his play Time For Elizabeth on an episode of Bob Hope Chrysler Theater. 1965 -- Book Memoirs of a Mangy Lover by Groucho was published. Groucho also made a series called Groucho for British television. 1967 -- Book The Groucho Letters published. Groucho appeared in The Greatest Invention In The World, an episode of I Dream of Jeannie. 1968 -- Film Skidoo, directed by Otto Preminger, features Groucho as a gang boss. Groucho also appeared in an episode of Diahann Carroll's series, Julia. 1973 -- The Marx Brothers Scrapbook, written by Groucho and Richard J. Anobile, was published. 1976 -- Groucho appeared in the television special, Joys, and his book The Groucho Phile, An Illustrated Life was published.